Insects, Poison Ivy, and Jellyfish "Oh my!" There are plenty of flying, stinging, and biting insects in Island Beach State Park. Their level of annoyance depends on a number of factors: the prevailing winds, the time of day, the time of the year, how close you are to standing water, and the vegetation can all make a difference. If you are on the beach the flies and mosquitoes can range from non-existant, to annoying, to downright maddening. A western breeze is especially ominous in that it pushes these biting beasts across the island to the beach. In other parts of the Island Beach State Park, especially if you are near standing water or along the bayshore, you are a lot more likely to run into flies and mosquitoes. Be sure you bring some some insect repellant or wear clothing that will protect you if the these pesky critters are out in force. Some ticks can carry lyme disease. Fortunately the swimming beach is not a place where you need to worry about them. 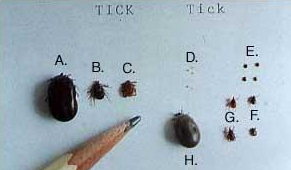 You do need to be careful about ticks whenever you are traveling through heavily vegetated areas. In Island Beach this is primarily when you are walking on the trails. Take steps to protect yourself when you visit places where ticks live and do a tick-check afterwards. You can find out more about ticks, ways to avoid them getting on you, how to do a proper tick-check, and how to remove an attached tick - here. There is plenty of poison ivy to be found in the park. The plant is very variable and its growth form will depend on the time of the year and the site where it is growing. 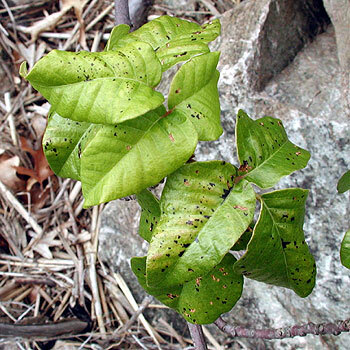 The picture below is from a website called what poison ivy looks like and you can visit that site to see the different forms this plant can take. The basic rule is: leaves of three, leave them be. You can also find out more about poison ivy here. You may get stung by a jellyfish if you are swimming in the ocean. Most of the jellyfish species you encounter (moon jellyfish) are not dangerous but they can cause you some discomfort. The immediate symptoms of a sting can vary from a prickly sensation to a mild burning where you were stung. You may also develop a rash and/or feel itchy where you came into contact with the jellyfish. Mild stings usually feel better relatively quickly...but the symptoms and your discomfort can get worse if you scratch the area a lot. If you get stung by a larger jellyfish and there are any pieces of it on you (the tentacles, which contain the stinging organs), get them off of you by rinsing with salt water, not fresh water. Don't grab the pieces as you will then get stung on your hands. If you experience a strong reaction to a sting this can mean one of two things. Either a fairly toxic jellyfish was encountered or you may be having a stronger than normal reaction to a sting. Don't hesistate to ask someone working at Island Beach State Park for advice or help, or go to a pharmacy in Seaside Park and ask the druggist if they have any recommendations, or go see a doctor. You can find out a more about jellyfish here.